An busy weekend in Châteauroux, France kicked off on Saturday evening with the 2016 edition ETU Aquathlon European Championships. Third recently at the Bloodwise Blenheim Palace Triathlon, Hannah Kitchen has made this championship a particular focus in recent years, finishing second two years ago and then adding Gold last year in Cologne. There would be no successful defence of that title this time around, but an encouragingly strong run in what is the weaker of her two disciplines enabled her to claim the Bronze medal and complete a 'set' over the past three editions. Natalie Milne was 6th (31:51). The men's Elite race was a podium sweep for Ukraine, with Philip Wolfe ninth (28:53) and Nathan Tweedie 11th (29:10), that result sufficient for Nathan to claim the Under-23 European Elite Silver medal. 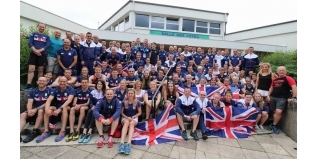 The GB Age-Group squad collecting a total of 37 out of the 63 medals presented, including 14 Gold. Here is the full rundown of the GB medal winners.